By Mehdi Mirakhorli (@MehdiMirakhorli), Associate Editor. Software architecture design is the first and the fundamental step to address quality goals surrounding attributes such as security, privacy, safety, reliability, dependability, and performance. Design Flaws in the architecture of a software system mean that successful attacks could result in enormous consequences. To satisfy a security concern, an architect must consider alternate design solutions, evaluate their trade-offs, identify the risks and select the best solution. Such design decisions are often based on well-known architectural patterns, defined as reusable techniques for achieving specific quality concerns. Security patterns come in many different shapes and sizes and provide solutions for enforcing the data integrity, privacy, accountability, availability, safety and non-repudiation requirements, even when the system is under attack. Previous estimations indicate that roughly 50% of security problems are the result of software design flaws such as miss-understanding architecturally significant requirements, poor architectural implementation, violation of design principles in the source code and degradations of the security architecture. Flaws in the architecture of a software system can have a greater impact on various security concerns in the system and, as a result, giving more space and flexibility for malicious users. Fundamentally, Design flaws (or only "flaws'') are different from Bugs, as the latter are more code-level while the former are at a deeper level and are much more subtle than bugs such as buffer overflows. Although a software system will always have bugs, recent studies show that the security of many software applications is breached due to flaws in the architecture. Architectural flaws are results of inappropriate design choices in early stages of software development, incorrect implementation of security patterns, or degradation of security architecture over time. An example of such architectural flaw is the Use of Client-Side Authentication, in which a client/server product performs authentication within client code, but not in server code, allowing server-side authentication to be bypassed via a modified client that omits the authentication check. This design decision to implement authentication creates a flaw in the security architecture. It can be successfully exploited by an intruder with reverse-engineering skills. Even though there are many techniques and practices such as threat modeling, static and dynamic code analysis, penetration testing that help developing a secure software system, there have not been many previous research papers in the literature that approach security from the architecture perspective. A recent effort is the IEEE Center for Secure Design launched by IEEE Computer Society. However as of today, there are not many examples or catalog of design flaws obtained or published yet that can help architects and developers learn and avoid such flaws. Therefore, in our research team, we are working on establishing a catalog of Common Architecture Weakness Enumeration, containing architectural weaknesses that may create security breaches within the software. This catalog is built on top of the previous library of Common Software Weaknesses Enumeration, which documents about 1000 software weaknesses. These weaknesses, however, are not categorized based on their architectural impacts and do not clearly distinguish between architectural weaknesses (security issues rooted in software architecture) and programming issues. We categorize these weaknesses into architectural and non-architectural and release the resulting catalog for the public. In addition, in a series of real case studies, we demonstrate instances of architectural weaknesses in four systems. These case studies indicate that the catalog of architectural weaknesses will be helpful for architects and designers to adopt a proactive approach to architecture-bases security. To ensure an application is secure, the security principles need to be implemented from the ground up. During requirements analysis, malicious practices are taken for granted, and requirements engineers identify all the use cases which are interests of an attacker. During architecture design, architects carefully analyze these requirements and adopts appropriate security patterns to resist, detect and recover from attacks. Flaws of Omission. Such design flaws result from ignoring a security requirement or potential threats. Such flaws identify decisions that were never made. A common design flaw is to store a password in a file without encryption. In this flaw the architect assumes that attackers would never have access to the file, thereby considering that the password stored in plaintext would not correspond to a compromise of the system. However, such design decision can open the system to attacks, because anyone, who has granted read access to the file, will be able to read all the stored passwords. Flaws of Commission.Such design flaws refer to the design decisions which were made and could lead to undesirable consequences. Examples of such flaws are “Client side authentication” or ”using a weak encryption algorithm” to achieve better performance while maintaining data confidentiality. Flaws of Realization. The design decision is correct but the implementation of that suffers from a coding mistake. For instance, the system was designed to have the Chroot Jail pattern. In this pattern, a controlled environment (“jail”) is created to limit access to system files so, attackers are avoided to exploit files/directories outside a specific directory. A common way to implement this pattern on Unix environments is to invoke the chroot() system function, which creates the jail but does not change the current working directory. Consequently, a developer may incorrect implement it through creating the chroot jail without changing the working directory, which allows that relative path still point to files- side the jail. Thus, attackers would still be able to access files/directories outside the jail even after invoking the chroot() function. The Secure Session Management pattern is concerned about keeping track of sessions, which are a set of activities performed over a limited time period by a certain user. The main goal of this pattern is to keep track of who is using the system at a given time through managing a session object that contains all relevant data associated to the user and the session. In this pattern, every user is assigned an exclusive identifier (Session ID), which is utilized for both identifying users and retrieving the user-related data. Since session IDs are a sensitive information, this pattern may be affected by two main types of attacks: session hijacking (an attacker impersonate a legitimate user through stealing or predicting a valid session ID) and session fixation (an attacker has a valid session ID and forces the victim to use this ID). Per this description we note that PHP was designed to store each data session in plain textual files in a temporary directory without using a security mechanism for storing these session files (such as encryption). 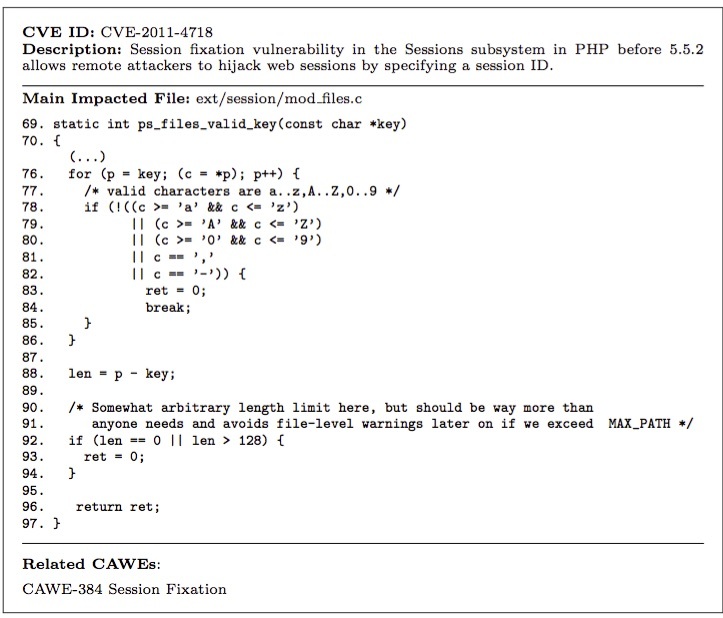 When closely inspecting the source code of PHP in version 4.0, we observe that the mod file.cc names every session file as "sess_xyz” (where "xyz" is the session ID), as shown in the code snippet presented above (where buf is a variable later used when creating the session files). Figure 1(a) shows a scenario in which the flaw could be exploited. First, a legitimate user successfully identifies him/herself to the application. This causes the Web application written in PHP to start a session for the user through invoking the session start() from the PHP’s session module. Then, the session module in the PHP assigns a session ID for the user and it creates a new file named as “sess_qEr1bqv1q4V2FGX9C7mvb0” to store the data about the user’s session. At this point, the security of the application is compromised when an attacker observes the session file name and realizes that the user’s session ID is equal to “qEr1bqv1q4V2FGX9C7mvb0”. 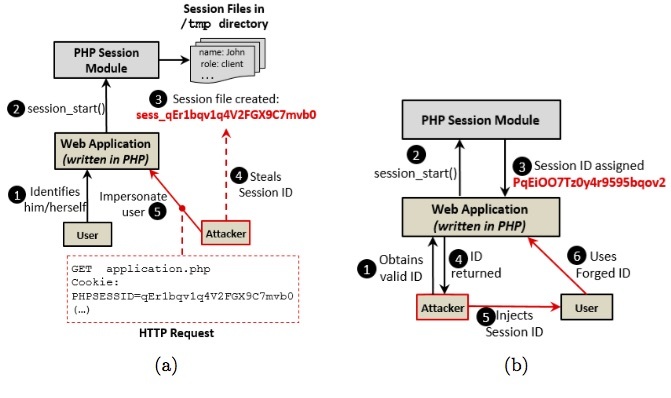 Subsequently, the attacker is able to impersonate the user through sending a cookie (PHPSESSIONID) in a HTTP request with this stolen Session ID. The Web application, after calling functions from the PHP’s session, verifies that the session ID provided matches with the user’s data so, the application considers that the requests are being made by a legitimate user. From this scenario we can observe that such architectural weakness can lead to many consequences. First, if the user has an administrative role in the application, the attacker will be able to perform all the administrative tasks. Second, the attacker may be able to read the contents of the session file, thereby accessing the data, which may be sensitive, about the user that the attacker is not supposed to have access. It is important to highlight that such flaw affects not only the Secure Session Management, but also other security patterns (e.g. Authentication and Authorization) which uses the Secure Session Management for performing authentication and access control of users. When verifying the session implementation in the source code of PHP version 5 we note that there is an incorrect implementation (i.e. a realization flaw) in the PHP’s session module that accept uninitialized session IDs before using it for authentication/authorization purposes. In fact, in the line 158 shown above, the function ps files valid key() does not properly validates the session ID, it only checks whether it contains a valid charset and has a valid length but does not verify whether the ID actually exists associated to the client performing the HTTP request. Figure 1(a) shows how this architectural vulnerability is exploited. 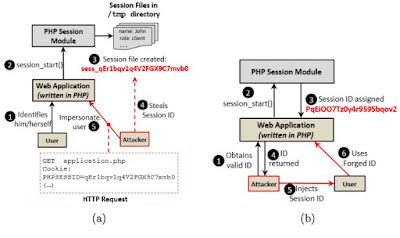 The attack starts with the attacker establishing a valid session ID (steps 1 to 4). Next, the attacker induces the user to authenticate him/herself in the system using the attacker’s session ID (steps 5 and 6). Given that the CAWE catalog provides detailed information about architectural weaknesses, it can be used to guide architects and developers make appropriate design and implementation decisions to preserve security concerns at the architectural level throughout the software development lifecycle. For example, code reviews are usually focused on finding bugs through technical discussions and analysis of the source code and other related artifacts (such as a portion of the requirements document, the architecture, etc). 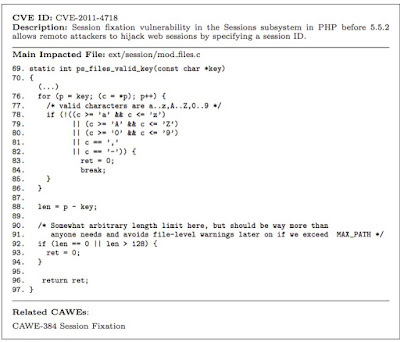 However using the CAWE catalog, the reviewers, who are responsible for inspecting the code, can check common security issues in their software. Past experiences in industry lead to the creation of security-driven software development processes, which emphasizes security concerns early in the software development lifecycle, such as CLASP (Comprehensive, Lightweight Application Security Process) and Microsoft’s SDL (Security Development Lifecycle). A common aspect of these processes and practices is the recommendation of providing proper training of the employees to promote a common background about software security. With this respect, our catalog could be used to aid such training and promote the awareness of the potential architectural issues that a system may be exposed to. Moreover, those security-driven processes include two activities for modeling potential threats in the software: threat modeling and design of misuse cases. These two activities are usually done through brainstorming sections. Such brainstorming could be aided with the CAWE for obtaining insights. In fact, practitioners in the security domain, support the usage of threat libraries, built from the MITRE’s catalog, for aiding this threat modeling process. Architectural risk analysis, which is a systematic approach of evaluating de- sign decisions against quality requirements, could also benefit from our catalog as a guidance for the evaluation. Iván Arce, Kathleen Clark-Fisher, Neil Daswani, Jim DelGrosso, Danny Dhillon, Christoph Kern, Tadayoshi Kohno, Carl Landwehr, Gary McGraw, Brook Schoenfield, Margo Seltzer, Diomidis Spinellis, Izar Tarandach, and Jacob West, Avoiding the Top 10 Software Security Design Flaws, IEEE Cybersecurity, 2015. Hall, Anthony & Chapman, Roderick. “Correctness by Construction: Developing a Commercial Secure System.” IEEE Software 19, 1 (Jan./Feb. 2002): 18-25. Linger, R. C. “Cleanroom Process Model.” IEEE Software 11, 2 (March 1994): 50-58. "This post includes joint work with Joanna Santos and Jairo Pavel Veloz Vidal, graduate students at RIT. Very interesting work, I read the master's thesis of Joanna and the future work looks promising.